Oh no! | Help! I live with my Italian mother in law! When I lived in the Caribbean I was always out doing something, riding a bike, playing tennis or swimming. But now that I am back in the colder climates I hibernate a lot. I have not been outside for three days and am worried that I may be turning into a bit of a recluse. I’ll blame the weather for now, but what’s funny to me is that I just did something a minute ago that was so incredibly Italian that I had to laugh at myself. It seems that most windows in Italy have a bit of a “ledge” hanging on the outside. 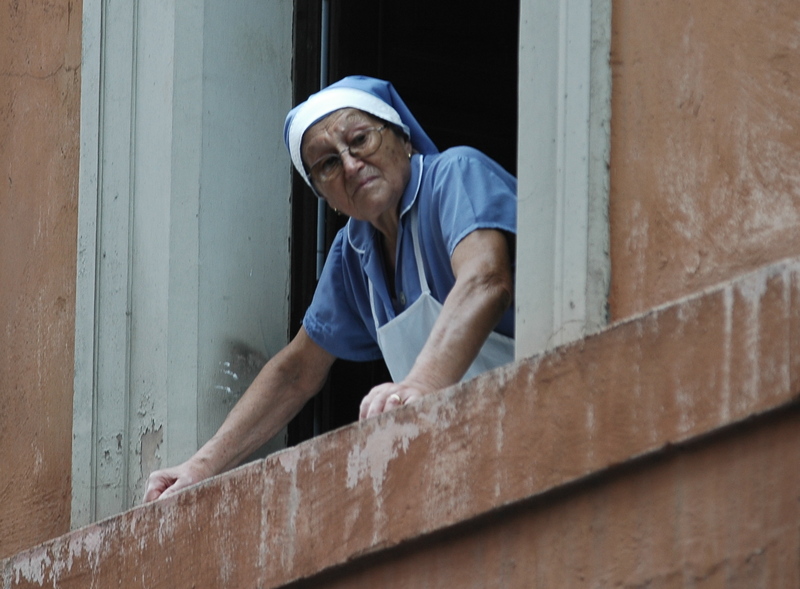 I have often walked down cobble stone streets snapping photos of older Italian women peering out of their windows. It seems to me that this is a National past time for old Italian ladies or perhaps they are just being super nosy about their neighbors. Well…guess what? I just opened the window wide, folded my arms and leaned on the ledge! I have been contemplating a walk all morning and thought I would stick my head out to see how cold it really was. What is happening to me? Have I become one of those old Italian ladies with nothing better to do than lean on a window sill contemplating life? Scuzi, I need to go put on my trainers and jacket and get the heck outta here! 3 Responses to Oh no! Hey at least you didnt toss out a bucket of dirty dish water….